* Bluetooth® is available in select countries. Perfect for both portable and installed applications Next‑generation enclosures offer a step up in both styling and build quality. Full‑range models feature lightweight, compact composite enclosures with internal reinforcement, designed to minimize resonance and increase rigidity and strength. With the lightest 18‑inch wood powered sub on the market, and a stunning 10‑inch top / 12‑inch sub compact combo available to serve smaller venues, there are options available for every application. Professional‑grade hardware includes three M10 threaded suspension points for forged eyebolts, integrated pole‑mounts, and our proven three‑handle design for easy lifting. 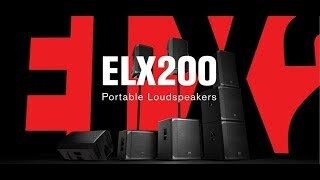 Heavyweight performance in a lightweight package Though ELX200 is easy to carry, its tough construction and components ensure legendary EV durability and sound quality, night after night. System reliability is verified with over 500 hours of abuse and endurance testing — far above and beyond industry norms. Super‑efficient Class‑D power amplifiers deliver distortion‑free maximum SPLs utilizing high‑sensitivity transducers — all designed and engineered by Electro‑Voice. QuickSmartDSP provides best‑in‑class processing via EV&apos;s signature single‑knob user interface with LCD Easy setup via four presets (Music, Live, Speech, Club), three‑band EQ, five user‑programmable presets, sub/top system‑match crossovers, input level control and metering, and master volume control to optimize gain structure. Electro‑Voice‑patented SST (Signal Synchronized Transducer) waveguide design combines a more compact footprint with enhanced acoustic performance The design allows for a larger waveguide, which is placed forward in the enclosure to time‑align the woofer and the tweeter, providing exceptionally precise and consistent coverage — all with deeper, tighter bass response. The ELX200 series offers professional Electro‑Voice audio quality, precision control, and robust, EV‑engineered components in an ultra‑lightweight package — a truly potent blend of performance and portability. Get the smooth clarity of the EV sound in the right size to suit your needs: with 10‑inch, 12‑inch, and 15‑inch two‑way models, and 12‑inch and 18‑inch subwoofers* available, ELX200 is a flexible, feature‑rich choice for DJs, mobile entertainers, bands, and musicians. *All are available in powered and passive versions.